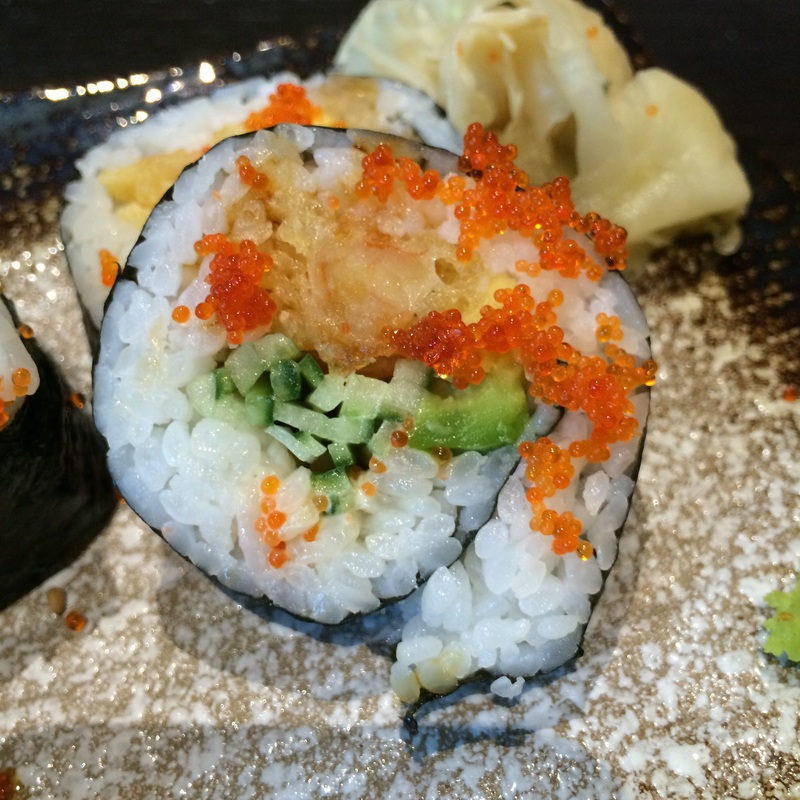 Leeds has a few Japanese restaurants, some I prefer more than others; Fuji Hiro which I adore, Little Tokyo which I know other people rave about, but I find inconsistent. Wasabi Teppanyaki (Granary Wharf) closed recently and Belgrave Teppanyaki (next to Sandinista) is still open (I think), but apart from that there isn’t much choice, maybe Chino Latino which again I’ve found inconsistent. 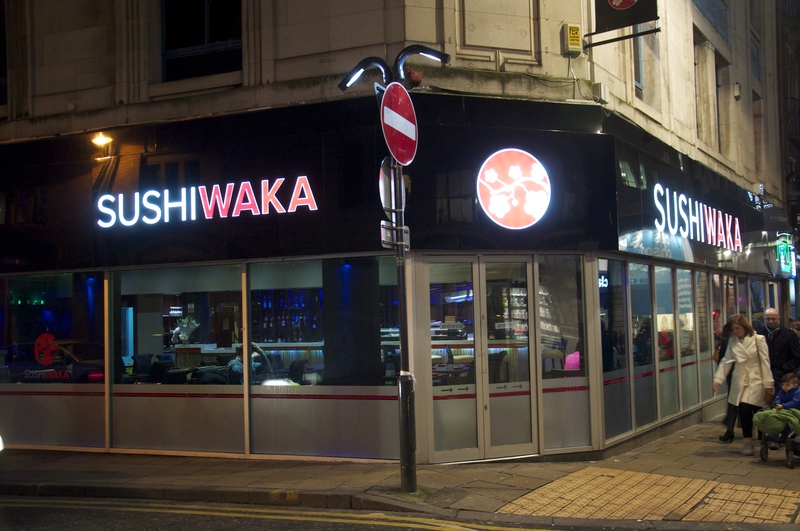 After that were looking at chains Yo Sushi and Wasabi for a sushi fix. Sushi Waka opened recently and with the prospect of meeting a Japanese food loving friend imminent, we jumped at the chance of visiting. Also tempted by their opening offer of 20% discount for booked tables, who doesn’t love a discount, a table was booked for 7pm on a Tuesday evening!! Walking up you can’t miss it, with bright signage making it a bit of a beacon. If you wander up to North Bar and the like you cannot miss it! Being a little eager, I’d had a nosey at the menu and it was like a Japanese food lovers delight: starters like gyoza and takoyaki, sashimi, sushi rolls in different forms, donburi bowls, noodle dishes, bento boxes the list went on!! With that being said quality over quantity is always better, so having such as extensive menu made me think how good it would be. In its previous guise as an Oriental fusion restaurant (can’t remember its name) I’d never visited, it didn’t look that appetising a place to eat from the outside. Probably a bit harsh, because it’s never stopped me going into places which look worse for wear in the search of a tasty feed!! It was a Tuesday evening, so a few tables were occupied, but it wasn’t overly busy. A very welcome drinks list was presented to us and we both fancied wine, deciding on a bottle of Merlot, but on ordering were disappointed to be told they only had house wine?! We were a little bemused by the situation, as this could’ve been mentioned earlier. Not wanting anything else other than wine, the house it would have to be, a few minutes later the waitress nervously brought over a bottle of Hardy’s, we’d also asked for some tap water, but this was forgotten about. It did the job, but it did irk me a little that it cost £17.50 though. It took us a while to order, firstly because we were so engrossed in catching up to peruse the menu, secondly as the menu had lots of choice. Waiting staff did ask if we wanted help and were very patient with us though, until we finally selected a variety of starters and a main dish each. Now my understanding with Japanese food, is food comes out when they are ready, but as they are listed as starters etc, am I right to assume the dishes would be brought out in this order, unless mentioned otherwise?? Maybe I’m wrong? 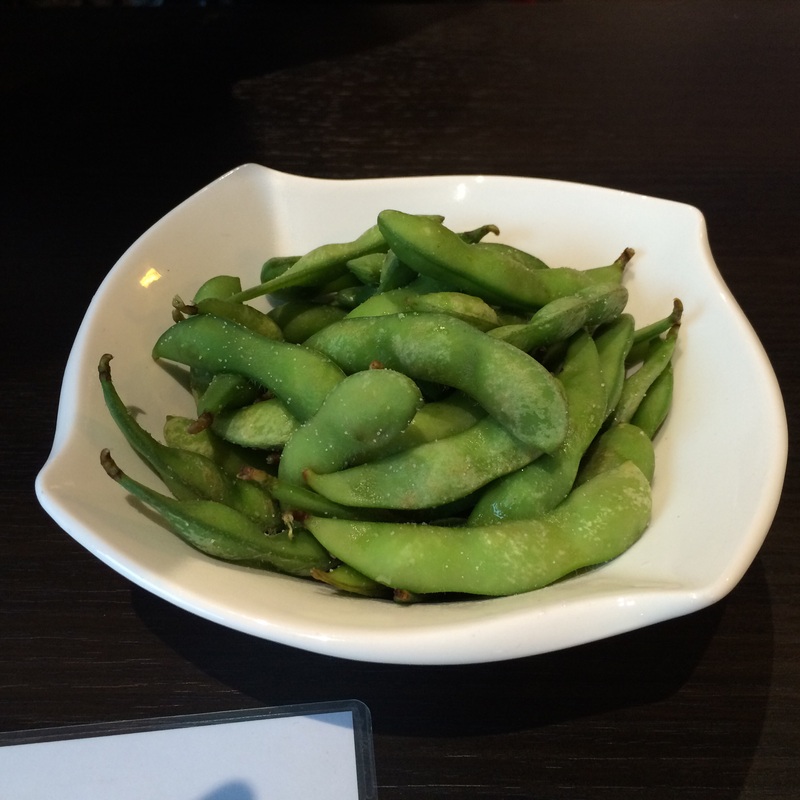 Well after waiting quite a long time, at least 40 minutes, dishes were brought out in a haphazard order, donburi first, then starters, edamame which is really an appetiser. 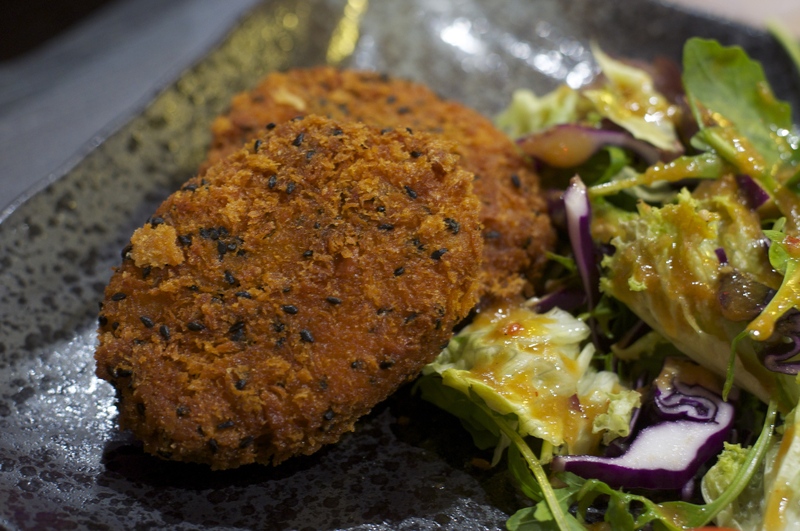 Lastly the Tonkatsu which there was some confusion over, whether it would come with rice or not?! This was spread out over a few minutes. 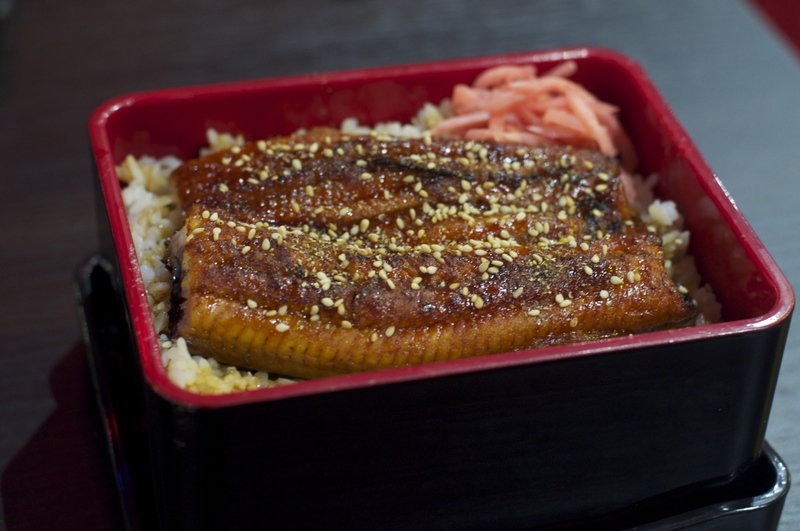 On appearance the food looked good, we were brought Unagi Don, a Donburi dish. I always love the presentation of eel laying on a bed of rice with picked ginger on the side. 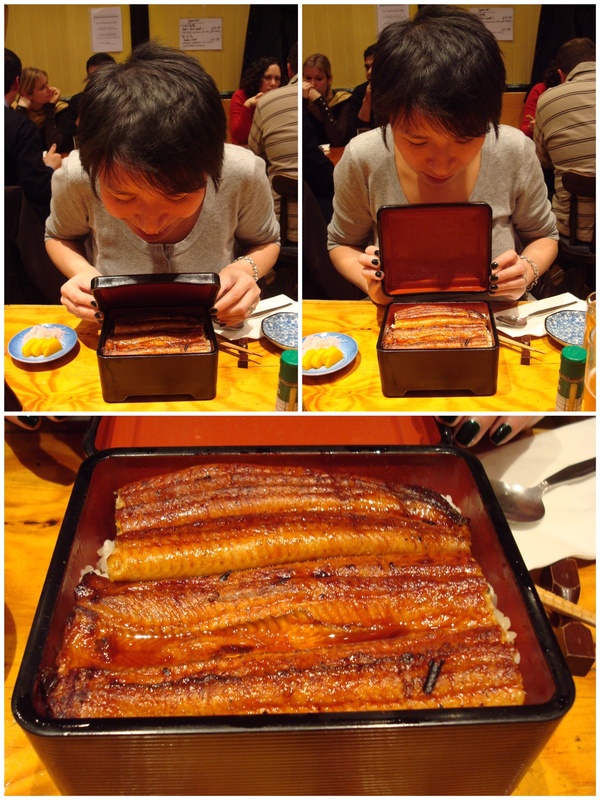 The meaty texture of the eel was as good as I’d remembered from the past, and with the rice makes for a filling dish. 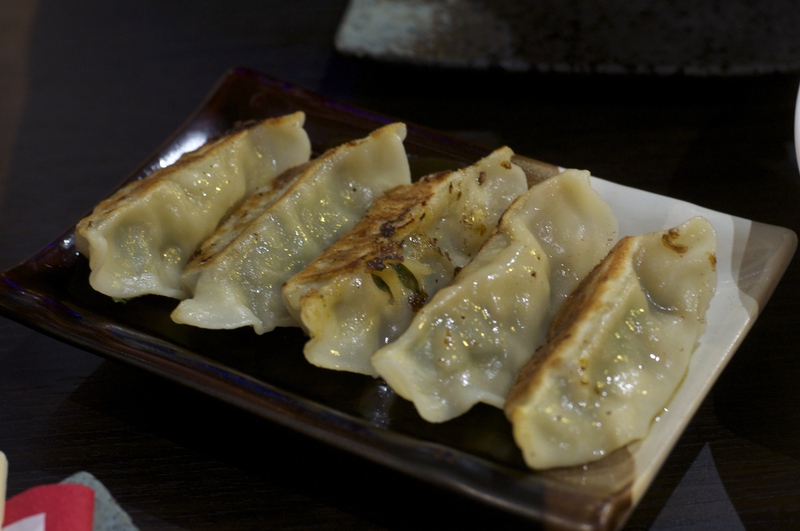 Our gyoza were tasty, not overly plump with tonnes of filling, but were flavourful. Their wrappers were delicate and had a lightly fried crust. 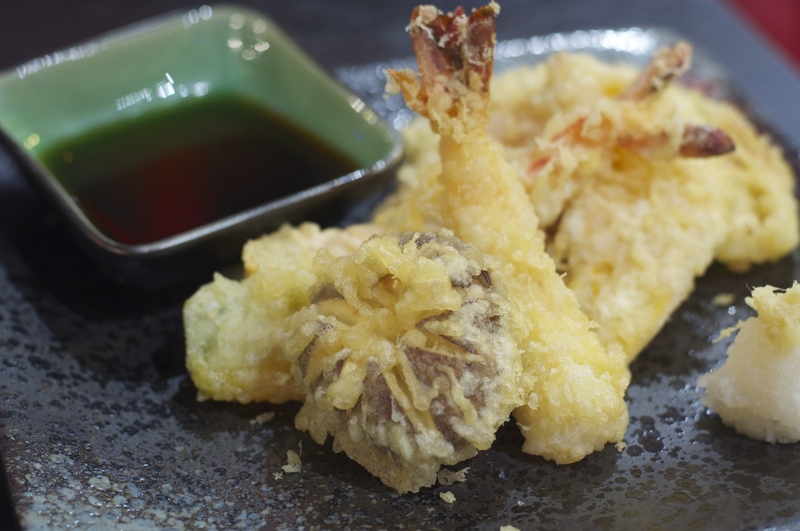 Mixed tempura had been nicely done, everything was coated in a perfectly light, golden batter; the prawns in particular being lovely and juicy. The Kabocha Korokke (pumpkin croquettes) which were very good, were covered in a lovely crust including black sesame seeds. 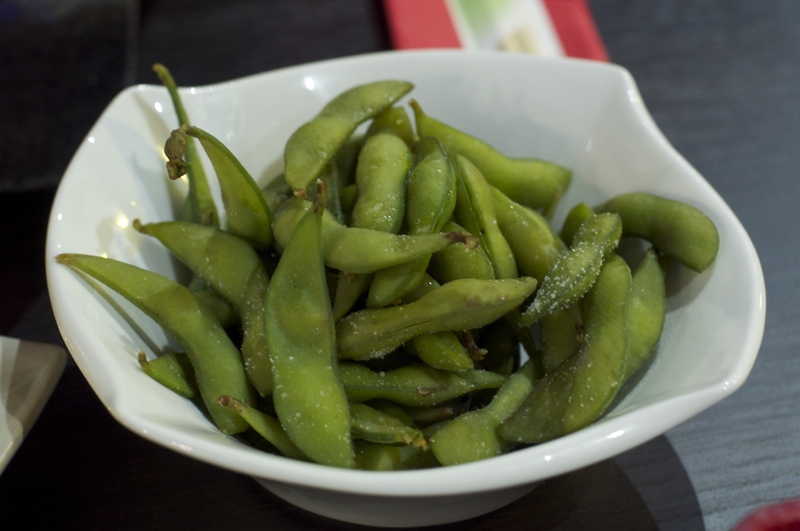 Lastly the edamame were fine, I much prefer them when they just come out of the steamer, lovely and hot. 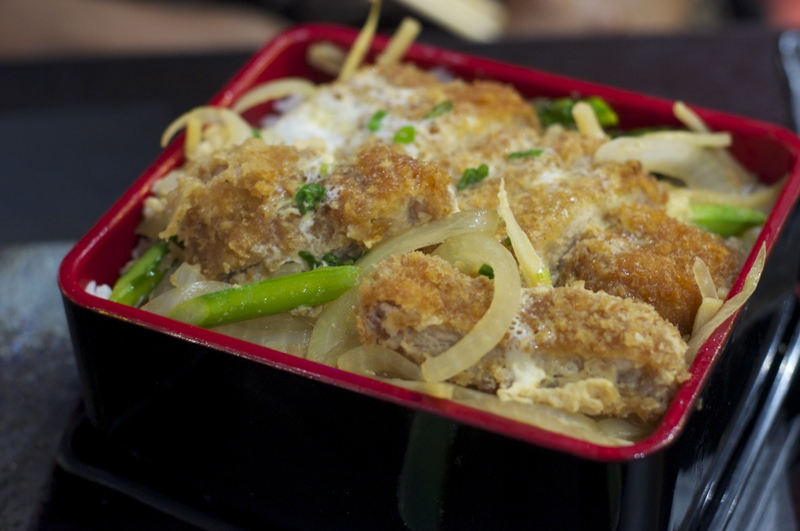 My friends tonkatsu looked a little odd as it had a white eggy covering on top, I wasn’t really sure what it was. It was supposed to have a katsu sauce which I found altogether lacking. On the plus side the pork tasted good and was still juicy and moist. Overall it was a bit of a mixed experience, I enjoyed the food, but find disappointing service frustrating. Saying that they have only been open a few weeks, so I’m sure are still finding their feet and will improve in time. Next time, i’ll be trying out the sushi. The total cost of our meal was £45.20 after a 20% discount, not including service. Food: extensive menu, generally done well, but some things could be improved . Service: needs a little work, slow from the kitchen and better communication needed. Atmosphere: hard to say when there was only a few tables occupied, but it nice to be able to catch up in an environment where the music wasn’t too loud. Our last evening in San Francisco called for a memorable meal to cap off what had been an AMAZING seven days all round. We’d happily filled our belly’s with brunch and snacks earlier that day, so by the time evening arrived we were up for something lighter. Wanting to stay within close proximity to our hotel, a quick nosey on the web pointed us towards Japanese, in particular Sanraku. 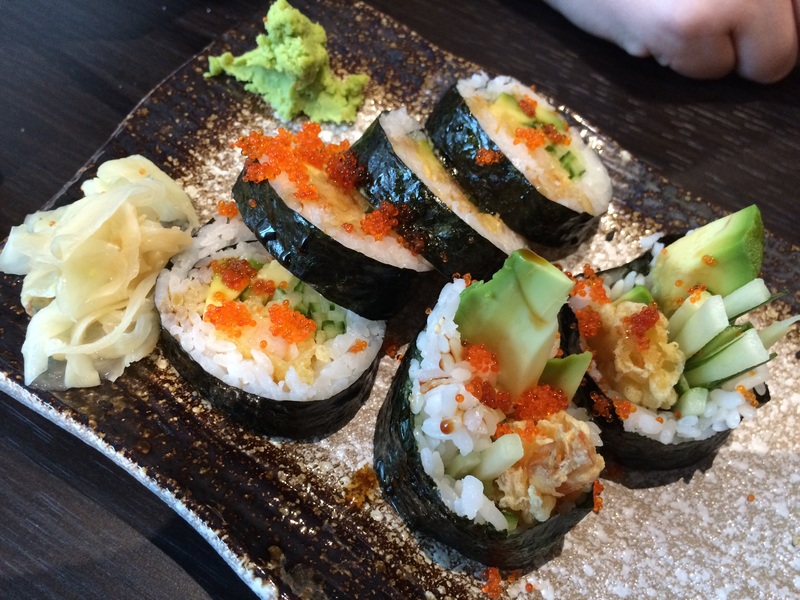 It just so happened that we both LOVED Japanese food and the plan was always to try some during our visit, I suppose it felt like it was meant to be! Found at the top of the Tenderloin district, this area is littered with a number of Japanese restaurants. We luckily managed to grab seats at the sushi counter even though we were going on spec, for me THE best place to eat Japanese food because you get an eye-full of highly trained sushi chefs working their magic. 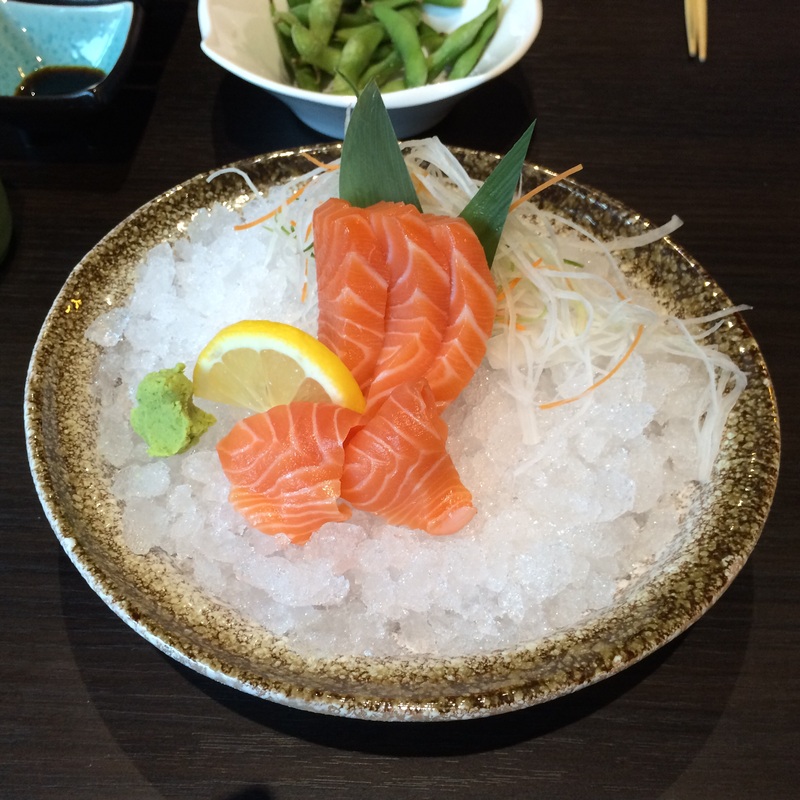 The menu is reasonably priced with good choice across the board, whether you are a sashimi or sushi fiend, or prefer something hot or with noodles etc. My friend was eager for nigiri which gave us a chance to see the chefs at work. 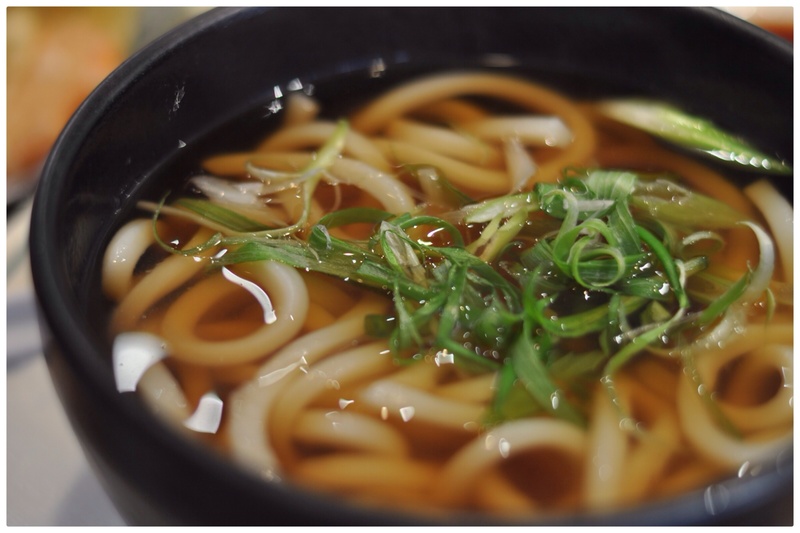 To follow that she chose the tempura udon. Whilst Lucy had chosen fairly quickly, it took me a little longer as there was so much I wanted to eat! 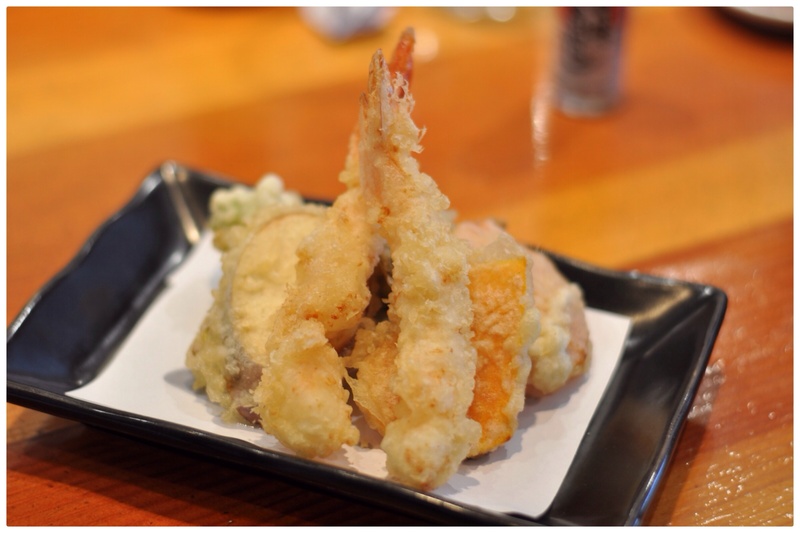 Eventually going for some of my favourites….soft shell crab and unagi donburi!!! I still watch hypnotised as sushi chefs work with such amazing precision; whether slicing fish, moulding the rice or making rolls. 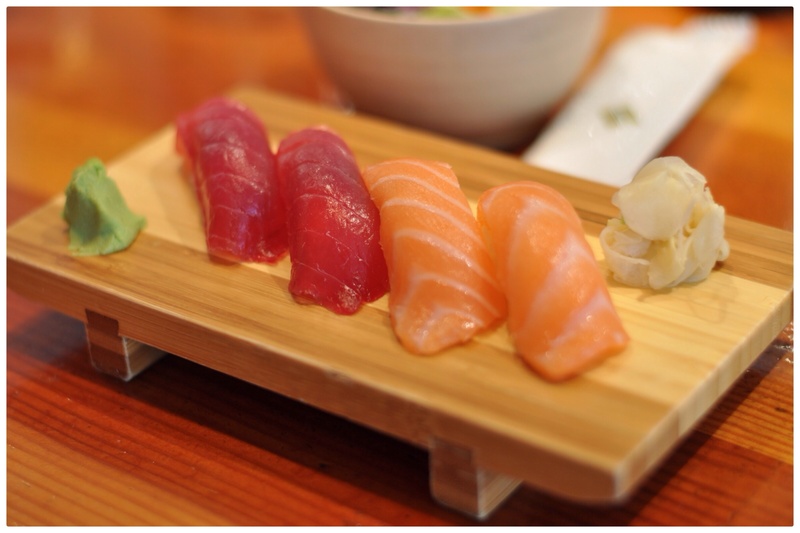 Within a number of minutes of ordering the nigiri were handed across the counter, simplicity and beauty personified on one board. 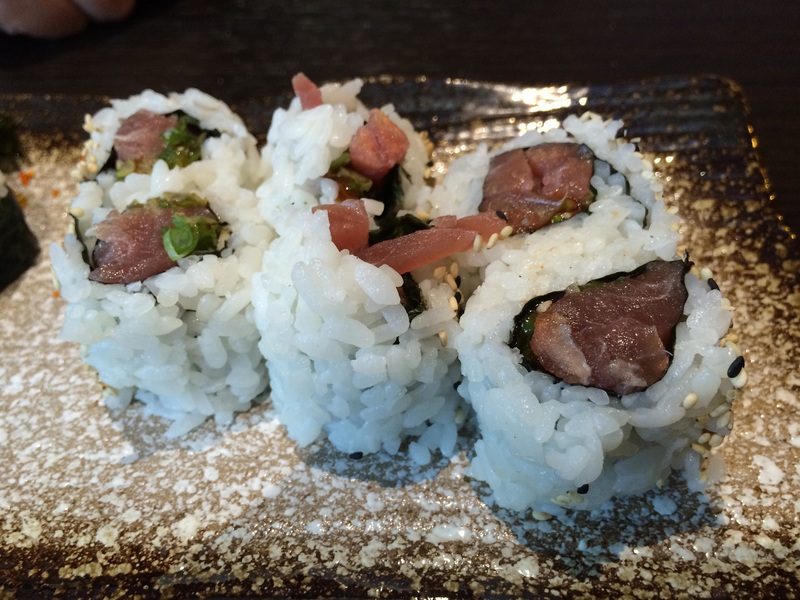 It’s surprising how vinegared rice and raw fish can be the stimulus for such joy when eating food, but that’s just how it was! 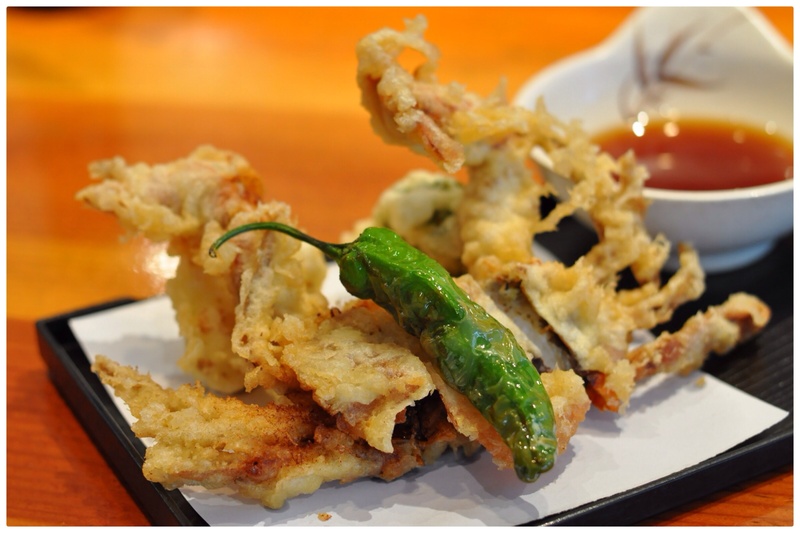 My deep fried soft shell crab with tempura sauce was cooked exceptionally well. One of my most recent reviews was Leeds’ own Zucco, where I raved on about their soft shell crab; this was just as good if not better. The batter was typically Japanese as it was fluffy yet perfectly crisp! Surprisingly it also had lots of meat, and came with a light dipping sauce that adding seasoning, but still allowed the crab to come through. 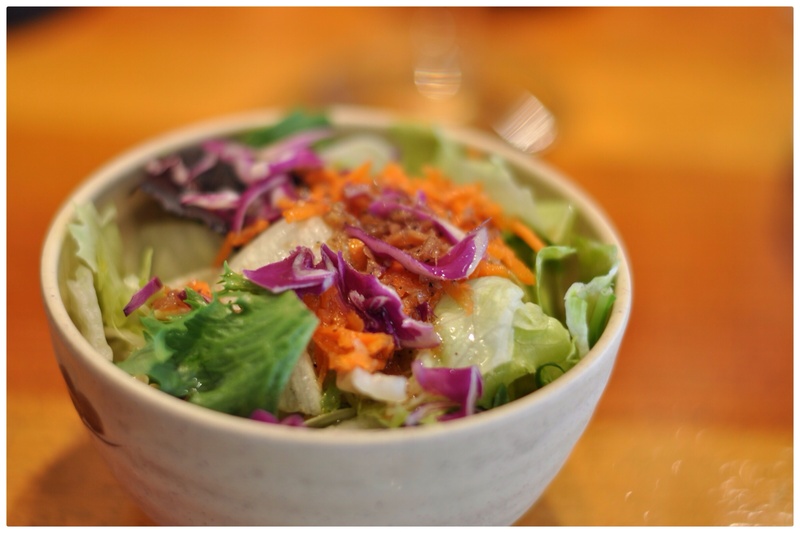 The accompanying house salad looked simple yet vibrant, it’s never something I choose to eat very often, but it would’ve been rude not to try. It certainly had crunch, a light dressing provided sharpness making it a nice palate cleanser and gave me something to graze on before the next course. 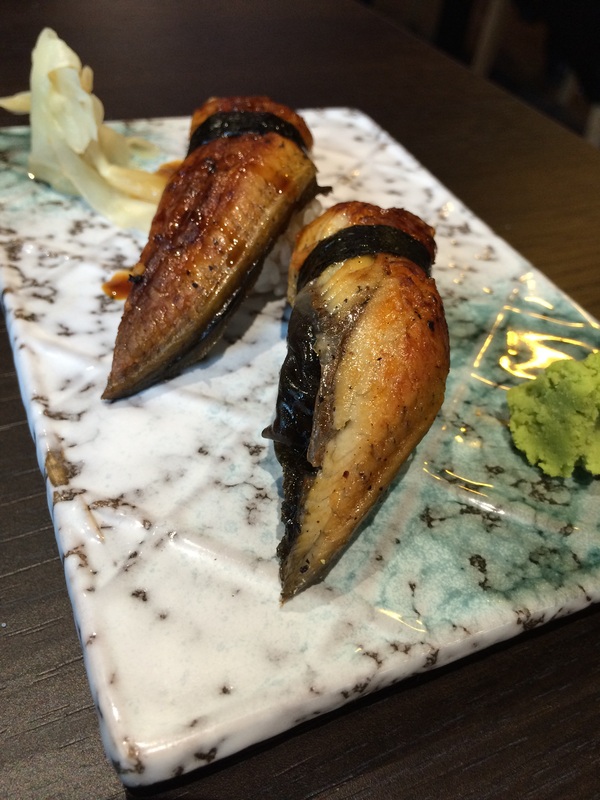 My first encounter with barbecued eel was at Yo Sushi, I’d pick unagi nigiri from the belt EVERY time I went. It wasn’t an addiction, but I definitely developed a soft spot for it. Consequently, it made me always looked for it on menus, but the first time I saw it play a key role in a more substantial dish, was during a trip to London with the best mate in December 2008. 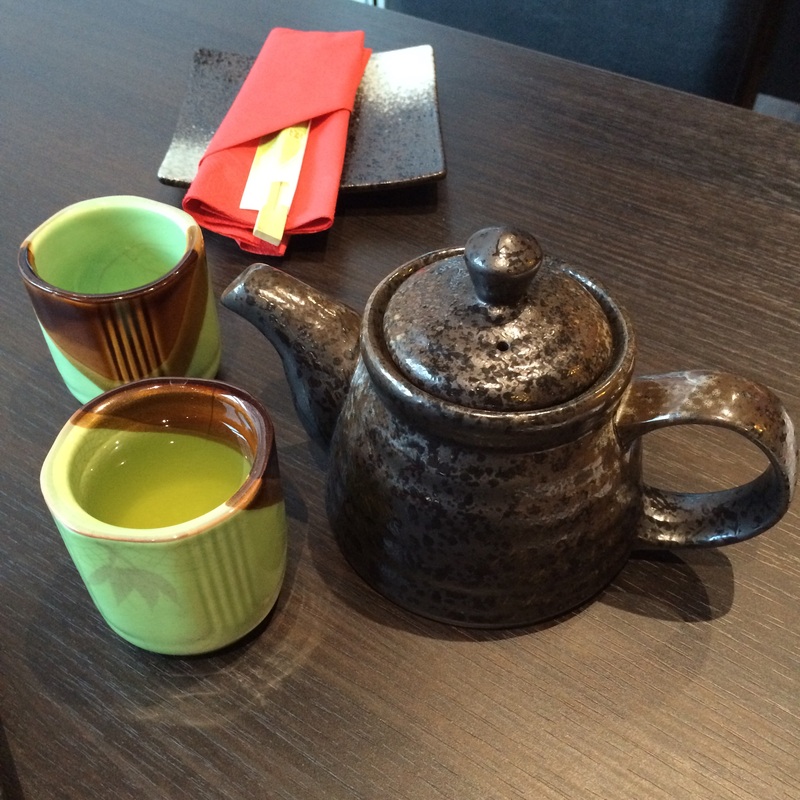 We ate at Cafe Japan in Golders Green, I ordered unaju unaware of how it would be served. We’ve often reminisced about that evening, when the unaju arrived in a square Japanese lacquered box, lifting its lid it brought a huge grin to my face and girly giggles when I looked inside!!! It’s been a favourite ever since. 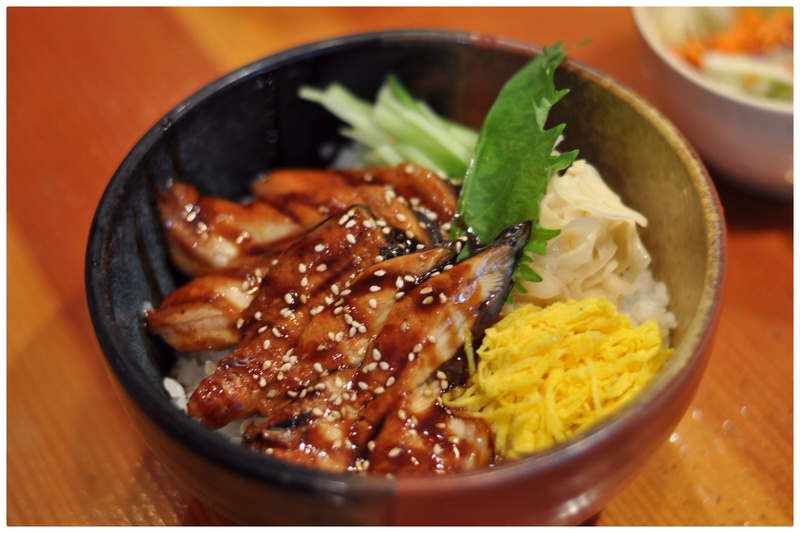 This time my barbecued eel (unagi) was in a round bowl so is called Unagi Don or Unadon (donburi means bowl). Underneath a bed of steamed rice, for garnish pickled ginger, thinly sliced sticks of cucumber and Japanese crepe, which I think is called usuyaki tamago. It’s a very filling and tasty dish, the eel is moist and is coated in a sticky soy sauce that has a sweetness to it, enough pickled ginger and other elements keep the dish interesting. The ratio of rice to eel was just about right and I managed to eat the whole thing, apart from a few grains of rice. 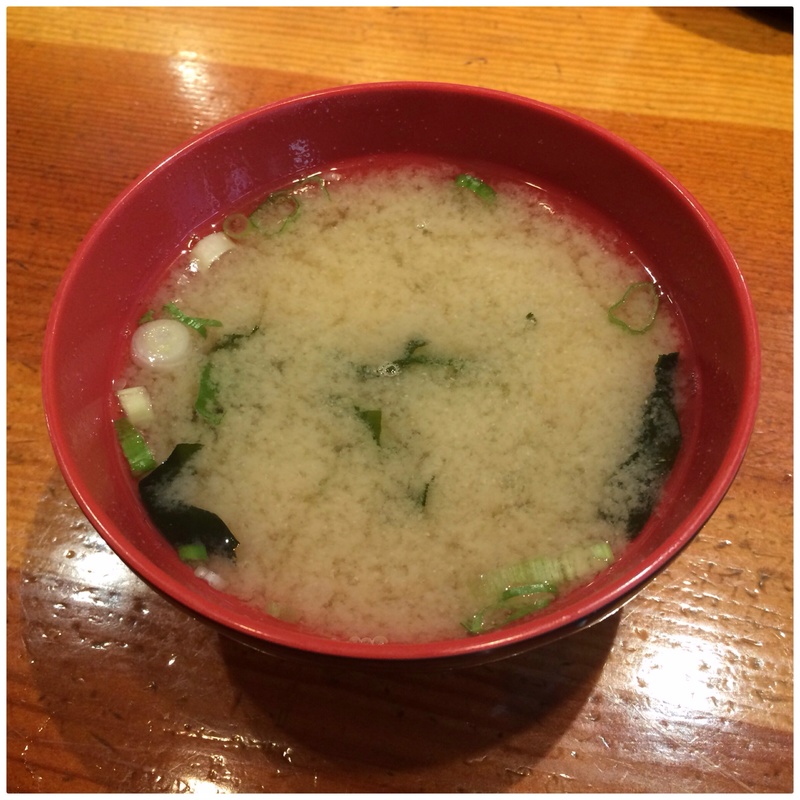 My miso soup was decent enough, salty with cubes of soft tofu, wakame leaves and spring onion. 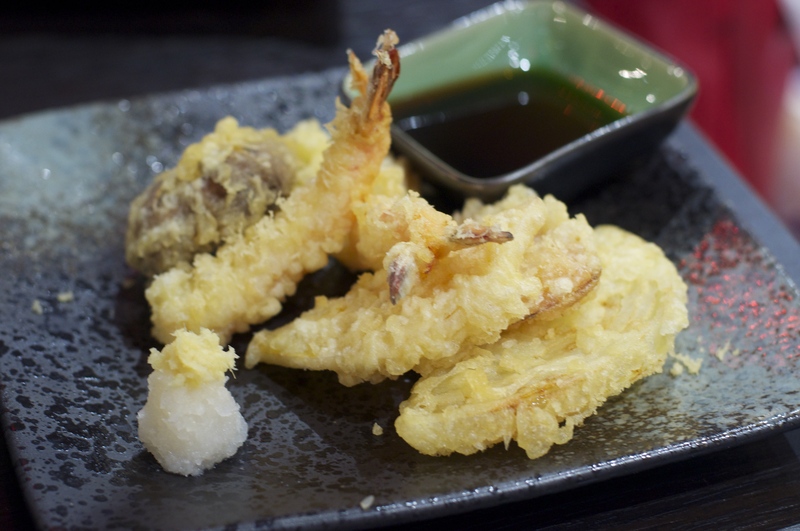 From Lucy’s point of view there were no complaints about the food, the tempura were cooked perfectly and had the characteristic fluffy and crisp batter, whilst the udon noodles in light, but flavourful broth were delicious. The portion was a generous one, so she was gutted to be sadly defeated by it. The cost was $77.21 for two people, not including a tip. 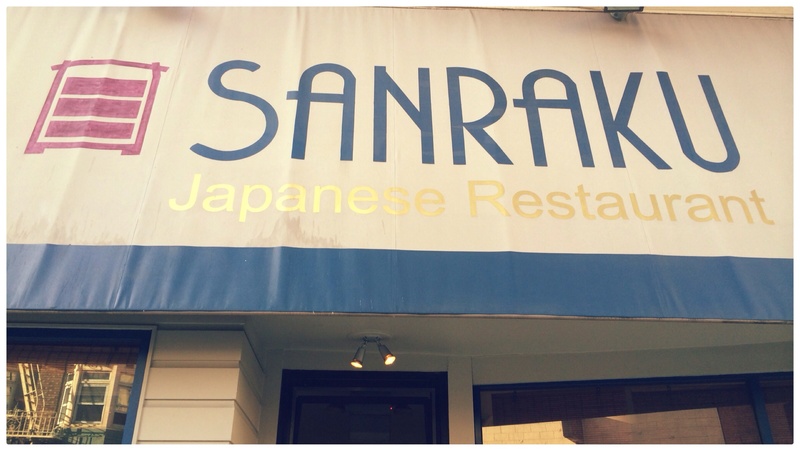 Sanraku was a great place for our last dinner in San Francisco and I’d definitely recommend it. 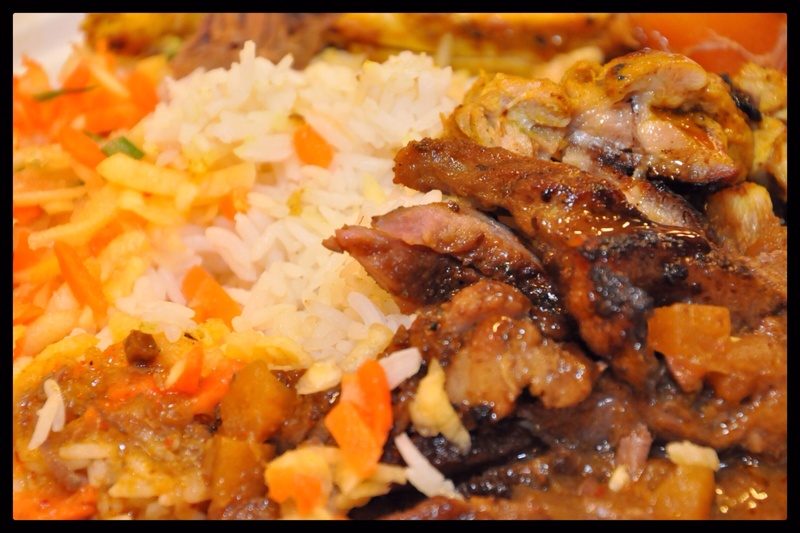 Food: great choice of dishes to suit people’s preferences. 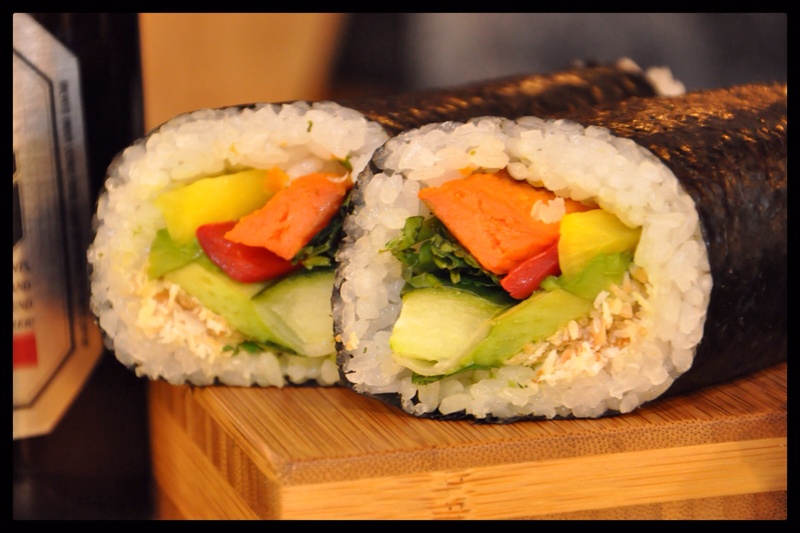 Sushi delivered in terms of quality and craftsmanship. Hot food cooked well and tasted great. Service: the service we received was exemplary from start to finish. Apart from the food it made our last meal special! 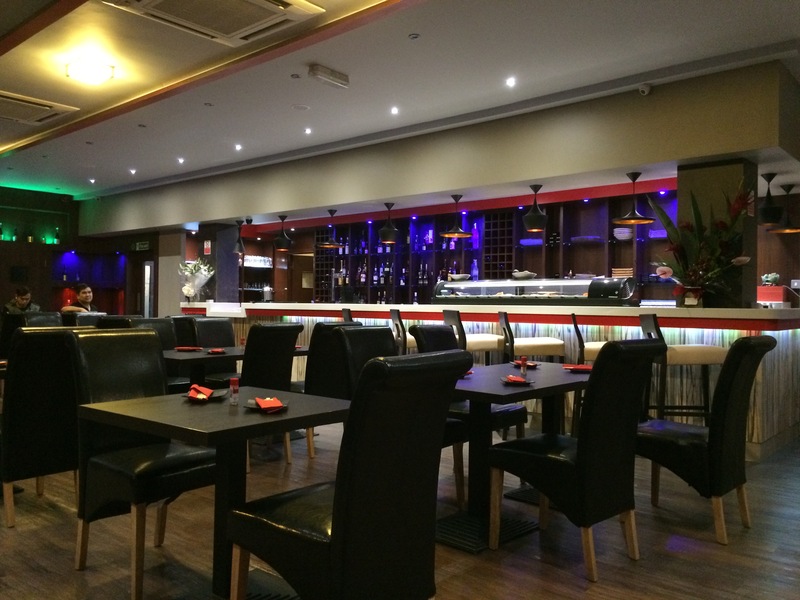 Atmosphere: at the sushi counter a quiet calmness resided, whilst the atmosphere elsewhere was a busy one, with a nice rumble of chatter from diners and busyness from waiting staff. 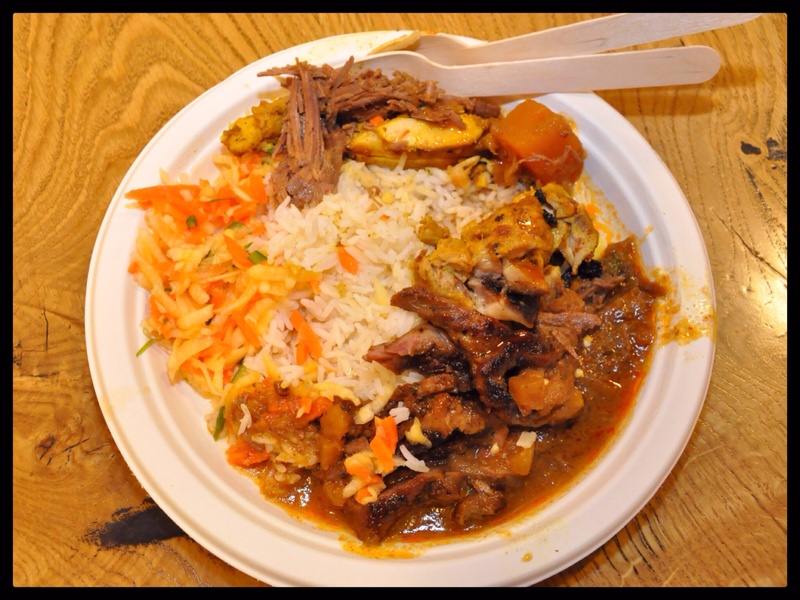 The latest street food changeover has happened once again at Trinity Kitchen and with a very sad farewell to last months traders, in particular Dorshi, Trinity welcomes traders both old and new to Leeds. 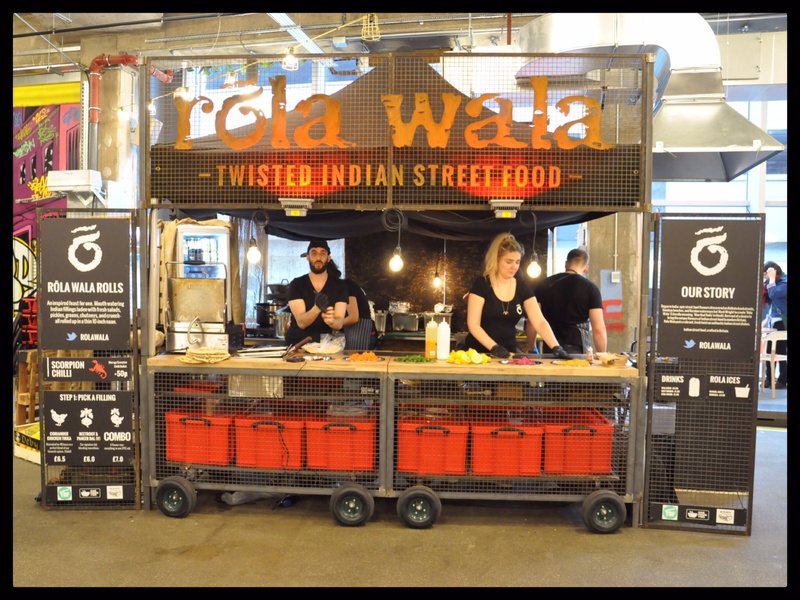 Rola Wala – Founder Mark originally hails from Perth in Australia, but moved to London as a University graduate. 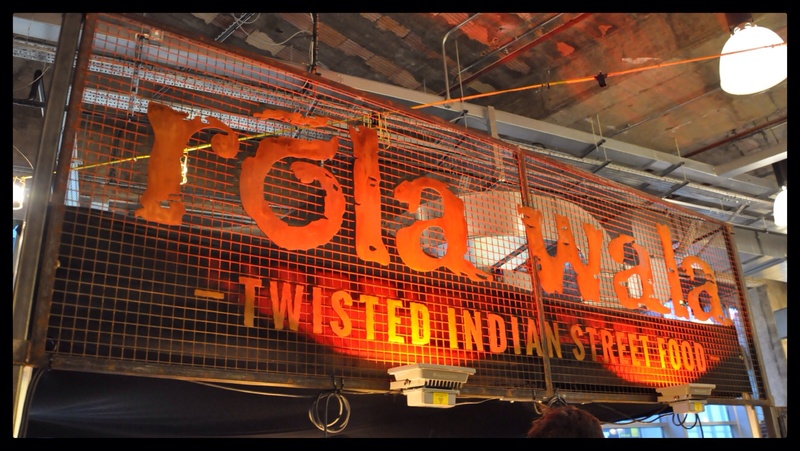 A trip to India was the inspiration for the business, wanting to bring the incredible flavours and his twist on authentic dishes he experienced to the streets of the UK. 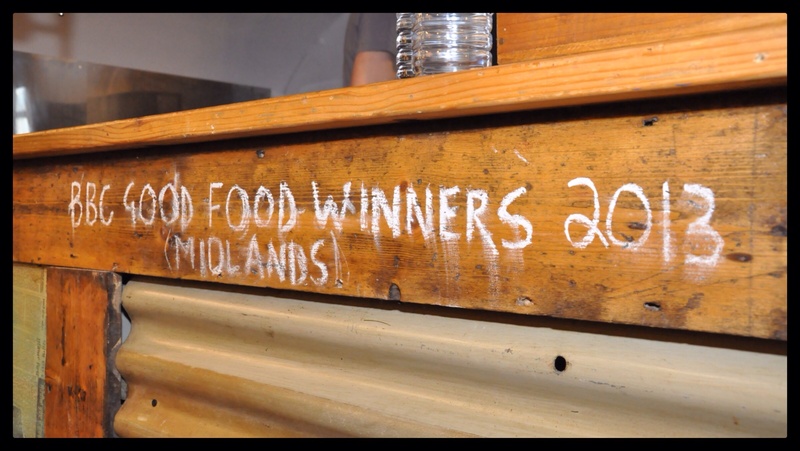 After meeting Adam they struck up a partnership haven’t looked back since, achieving Young British Foodie Runner Up Best Street Food UK, 2013 and are regulars on London’s street food scene, including Street Feast and Kerb. 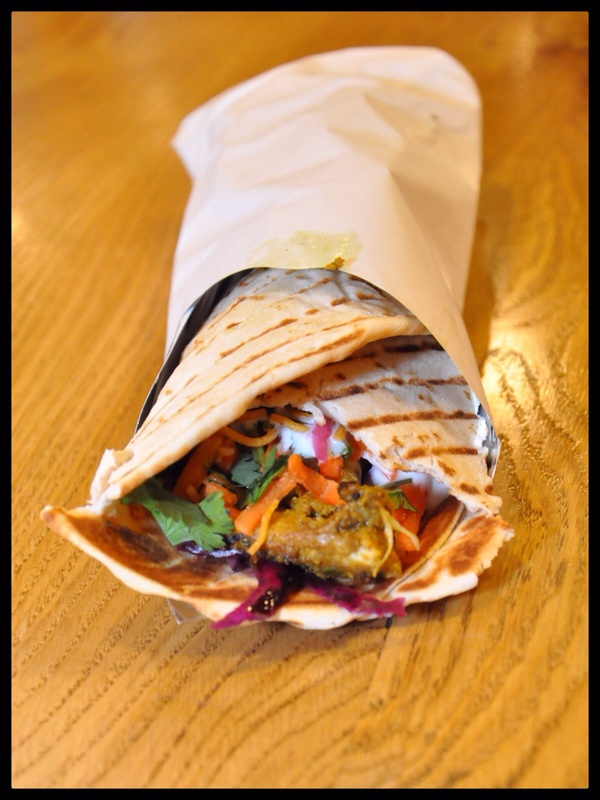 Rola Wala are bringing to Leeds their toasted 10-inch Naan filled with either Beetroot Daal, Coriander Chicken tikka, or for those who can’t decide, (or just greedy) a half and half combo with prices ranging between £6-7. I munched on the Coriander Chicken Tikka Naan – it was DELICIOUS, I think I’ve found a new favourite! It’s not the cheapest street food by any stretch of the imagination, but it does the job in terms of flavours, textures and heat. I also loved its vibrant colours that sang out too!! 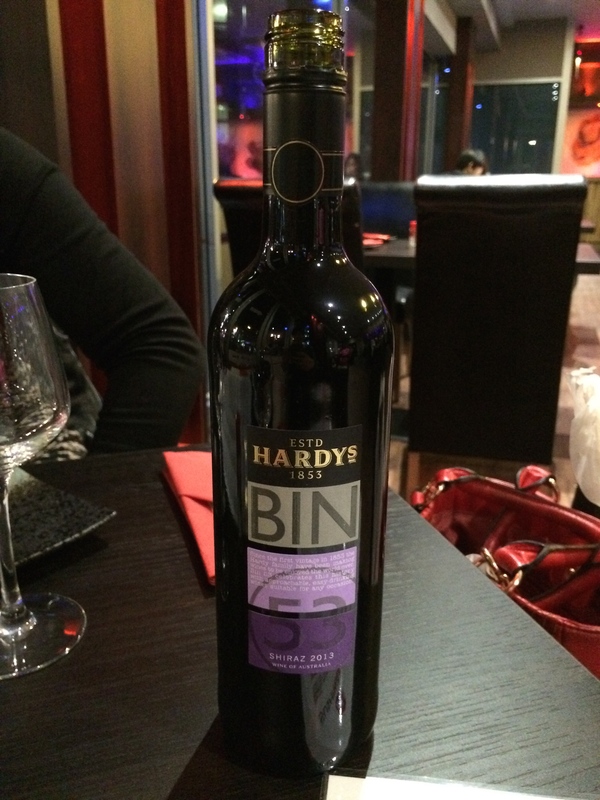 I didn’t go for the extra kick of spice, it was a wise choice too as mine had plenty of oomph and left me with distinctly rosy cheeks!! Beetroot Dhal and Coriander Chicken Tikka Combo Naan!!! I loved it!! It was typically creamy with the primary ingredient mango clearly evident and a lovely texture of coconut running through it. 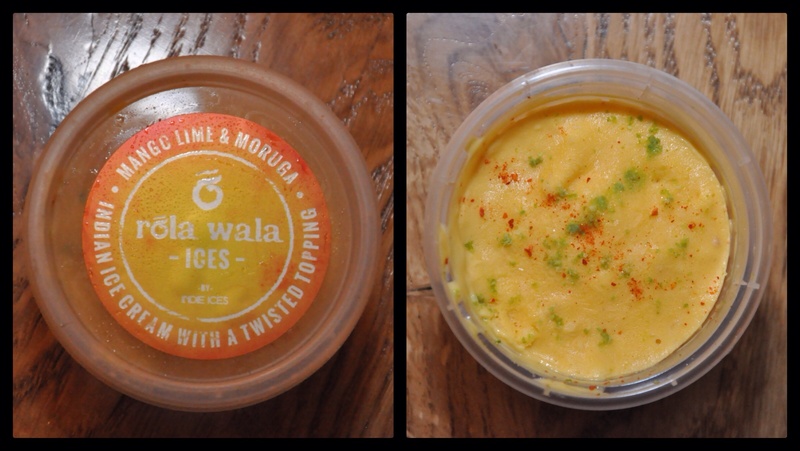 The lime kept it fresh and with a hit of chilli giving it another dimension, it certainly kept me on my toes. Every now and again I’d get a mix of well balanced flavours, textures and heat. Simply inspired! 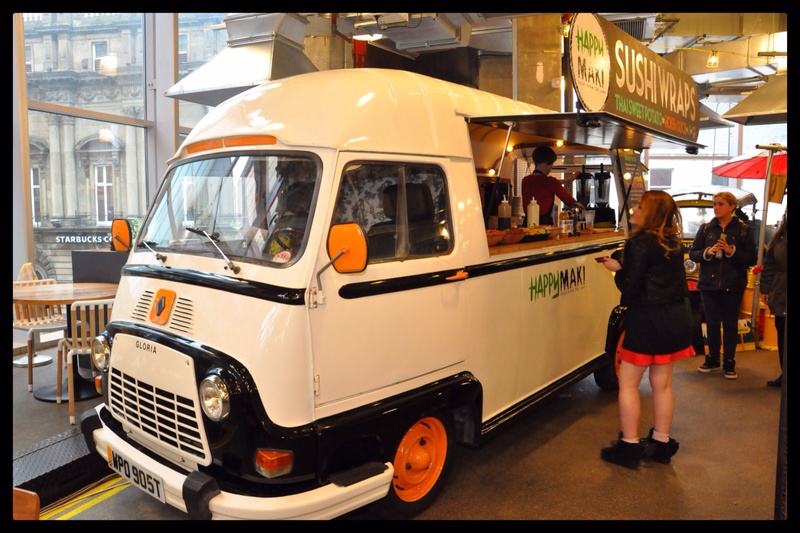 Happy Maki‘s owner Anna is serving the Leeds masses with Sushi wraps from her Renault Estafette fondly named Gloria. 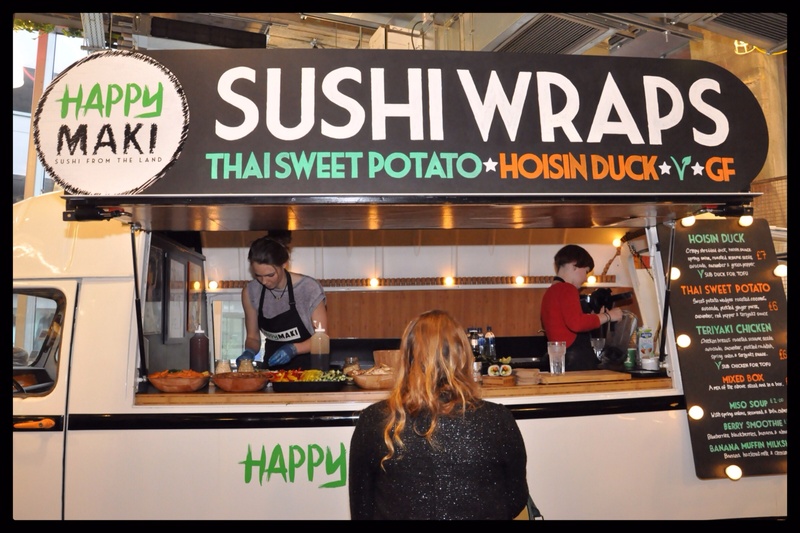 She’s devised a thoughtful, healthy and socially conscious menu, catering for carnivores, vegans and vegetarians alike with her Thai Sweet Potato, Hoisin Duck and Teriyaki Chicken Wraps. I didn’t manage to sample any on this occasion, but I have a sneaky suspicion that my love of all things Japanese will make me gravitate towards some Teriyaki chicken!! Cake Doctor has been brought to Leeds by owner James, who’s only been in the business six months or so! 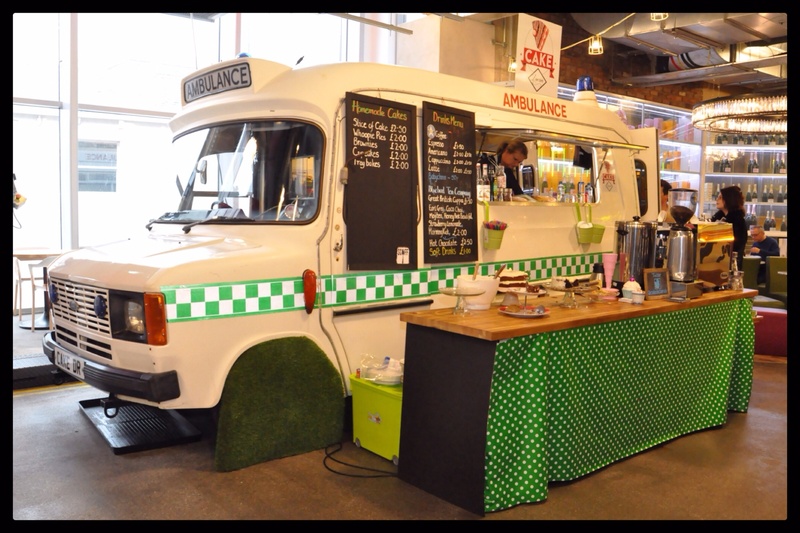 On his converted 1979 Ford Transit Mk 2 Ambulance he’s baking (on site) a fantastic range of baked goods, such as Whoopee pies, Meringues and Victoria Sponge. With tea from Bluebird Tea Co and coffee from local lads North Star there’s some quality beverages to wash them down with. Being inspired by baking with his mother and grandmother, as a child James wants to transport cake lovers to a place where they can reminisce about fond childhood memories. 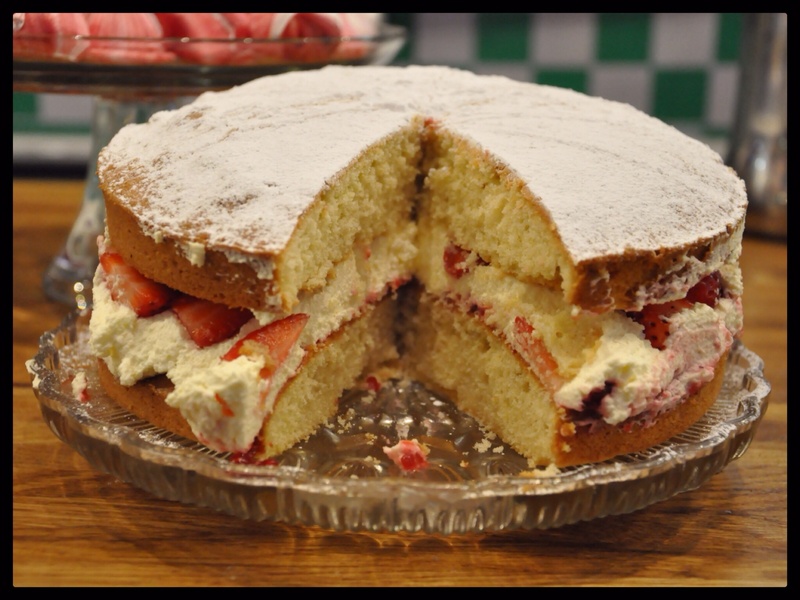 On this occasion, there was a Victoria sponge that caught my eye!!! Readers may know of my love of the classic bake, you may also know that I don’t need asking twice if I want a slice to take home!!! It came with a pretty Meringue Kiss, which was a sweet little touch. 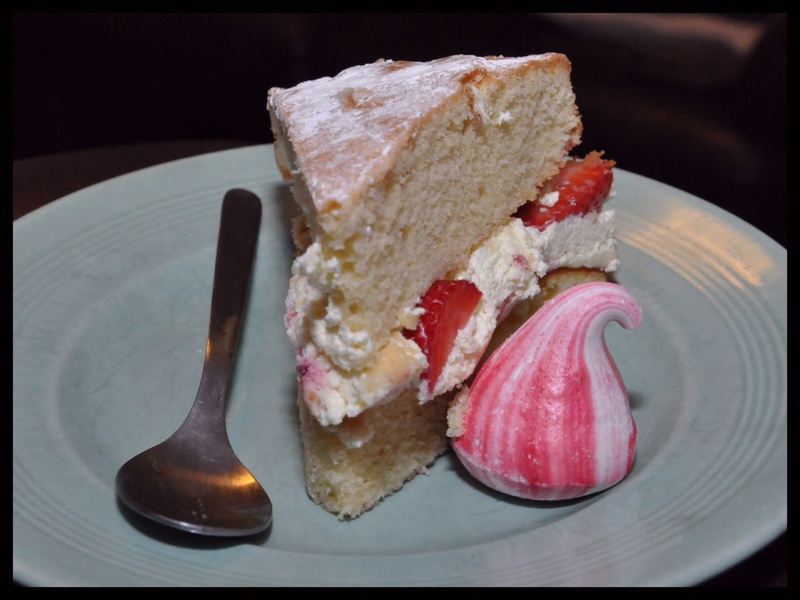 I liked the Victoria sponge; the cake itself was a tad dense, but rich and buttery. The cream and fresh strawberries were VERY yummy, as you’d expect. 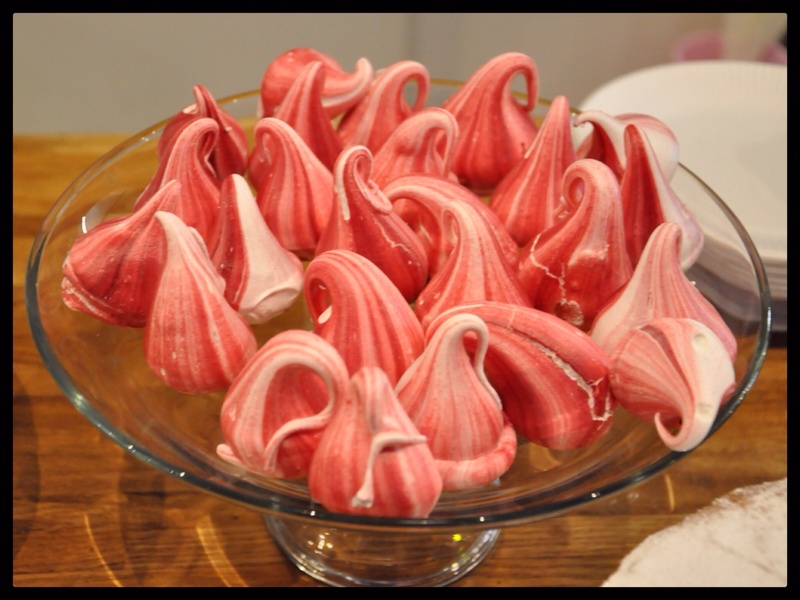 I left the meringue kiss to the end and it was heavenly – light, chewy and sweet. If only I’d known they were that good, I’d have bought a lot more!!!! Having read James’ plans for an urban afternoon tea at Cake Doctor, I’ll have to partake in this myself before his residency is up, so I can add this to my Afternoon Tea blog series. 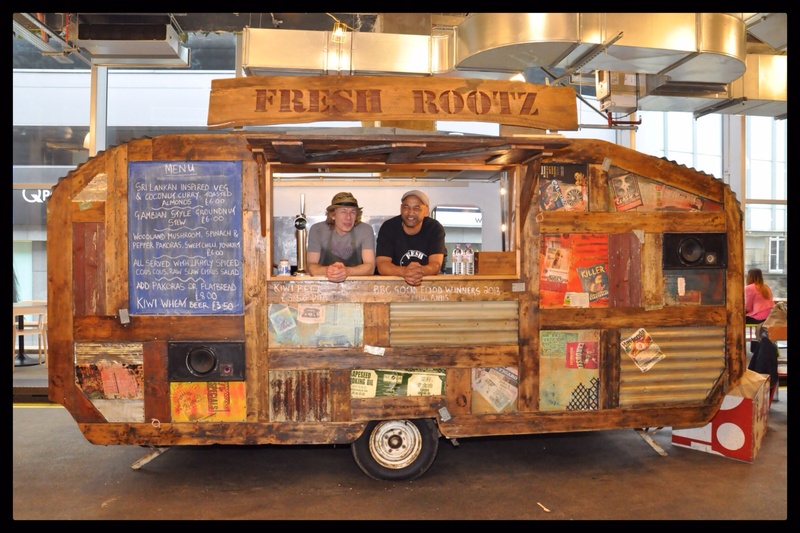 Fresh Rootz are back for a second helping of the Trinity Kitchen experience. 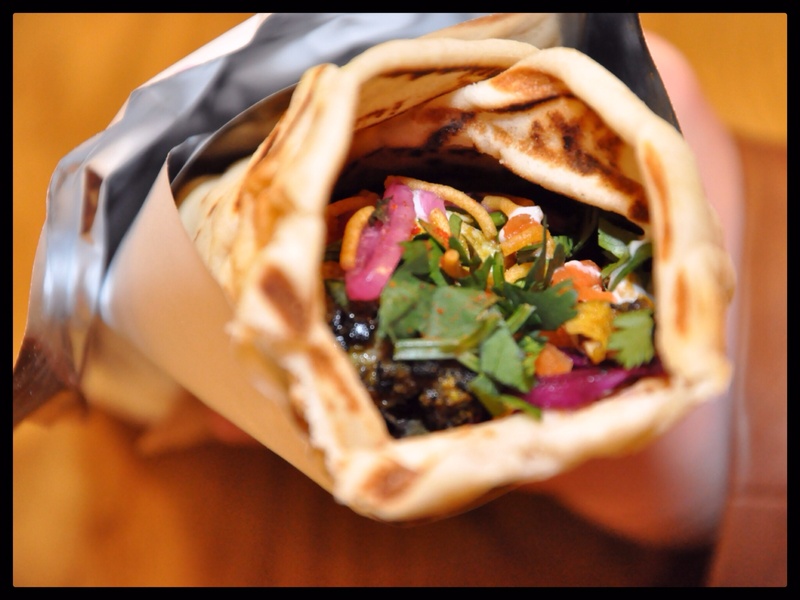 This widely travelled band are offering food inspired by their travels around the world. At Trinity they’ll be dishing up their menu using local ingredients containing at least seven fresh vegetables in each main dish!! Healthy or what! 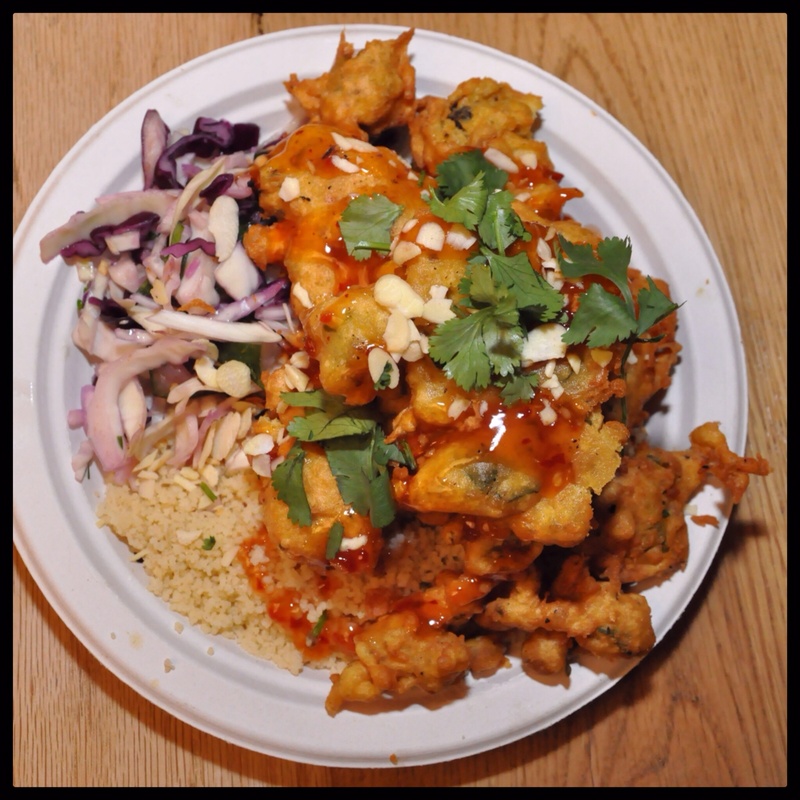 I went for a portion of pakoras at £6, they were cooked to order and so good because of it – lightly crisp, fluffy in texture and well flavoured. Working well with a drizzle of sweet chilli sauce and the citrus salad which gave a little acidity. It was missing the yoghurt which would have provided a nice cooling effect, but they were still very good!! For £6 it was a generous portion too and something I wasn’t expecting, the glutton that I am wasn’t complaining though! 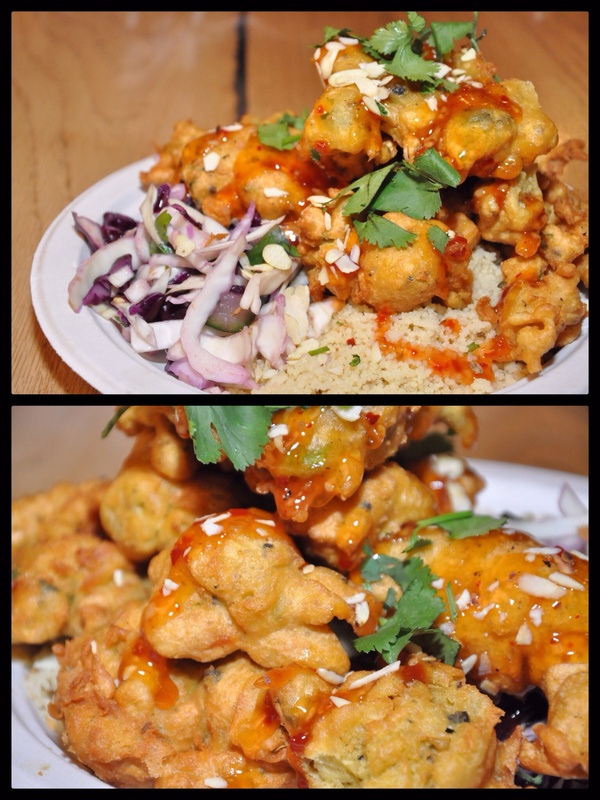 Yeah, I really enjoyed my plate of pakoras, and I’m not their only fan as Fresh Rootz won BBC Good Food Show for Best Midland Street food in 2013! 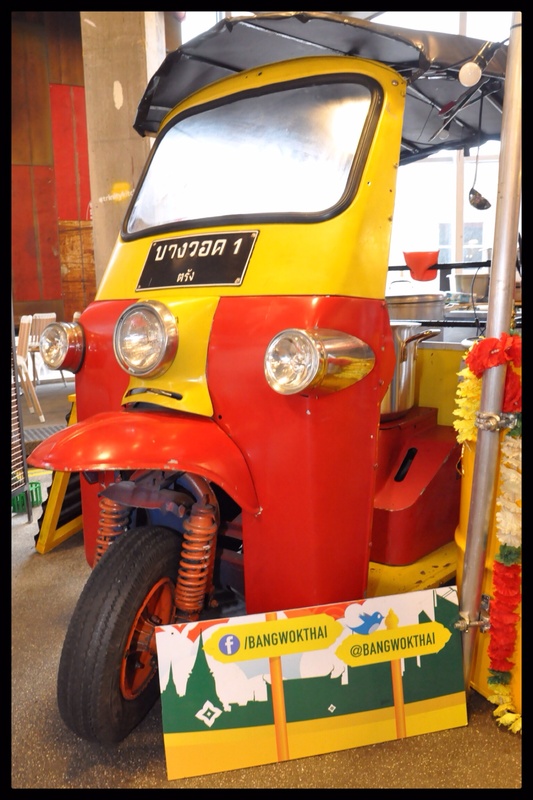 Bangwok have returned with their tuk tuk in tow! 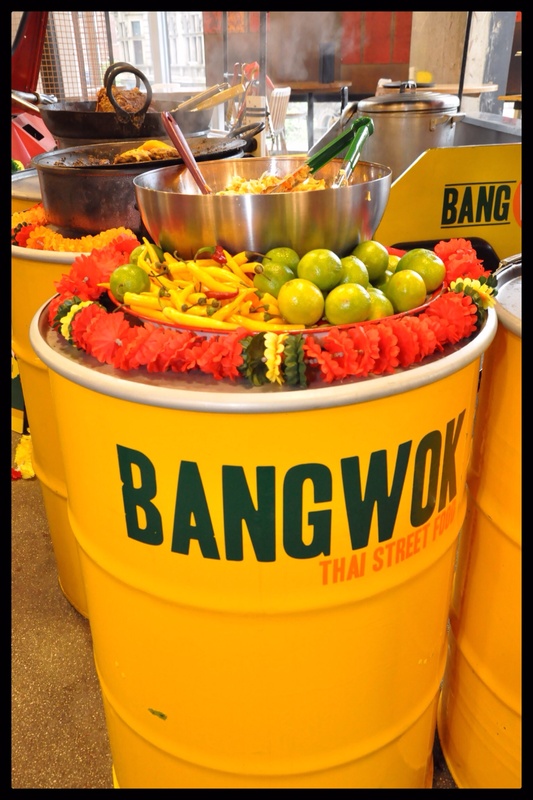 I really enjoyed their Thai food on their 1st visit and I was expecting more of the same!! 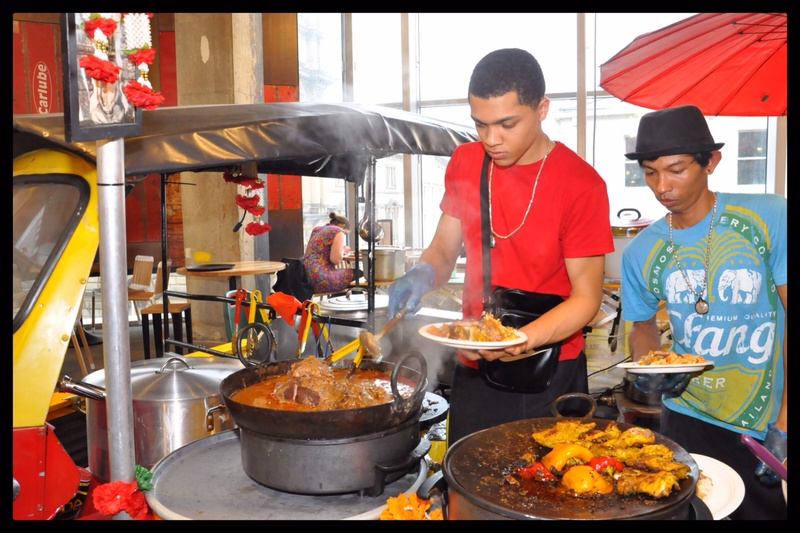 At Trinity they’ve set up their ‘raan khao kaeng’ – a rice and curry shop where you can choose from green chicken curry, beef massaman and honey roast pork – or like me have the combo plate of all three with rice. The sights and smells coming from their stall drew me in hook, line and sinker and I quickly chose their £7 deal of a bit of everything. £7 is a bit more than I’d like to pay, but for the portion size and flavours on show I was pretty pleased. I think this months street food ambassadors could be one of their best line-ups so far. So don’t just take my word for it, head down to Trinity Kitchen and see for yourself! Disclaimer: I was invited by Trinity Kitchen last week to get a taste from the new cohort, but I have been back since of my own accord.